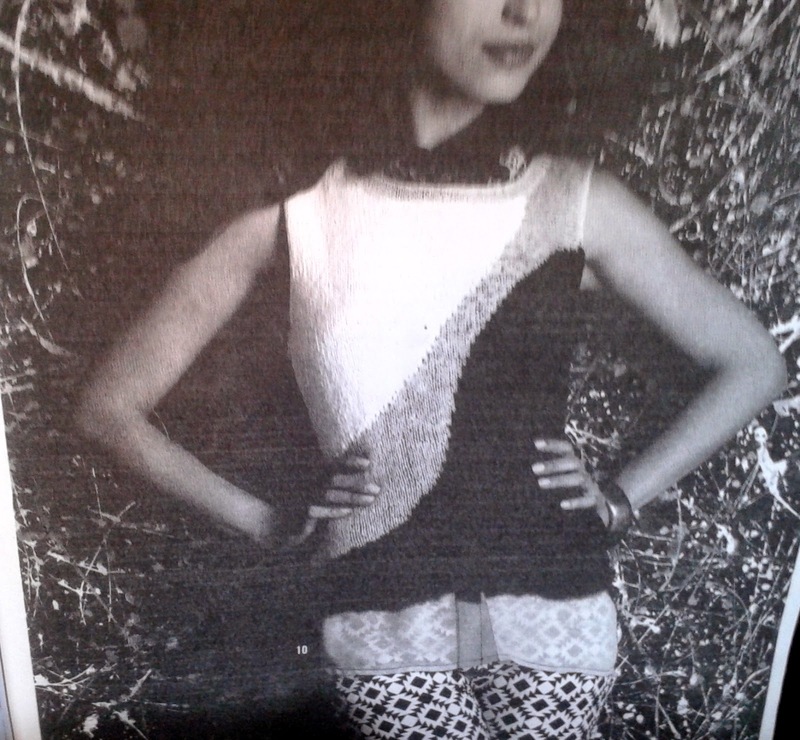 from last summer's Vogue Knitting. Over the last few months, a group of summery yarns - cotton yarns in summer colours - had been accumulating in my stash. They were all purchased separately, with originally, no 'group' intentions. Until one day, they all seemed to land up beside each other on my shelf. 'Wow!' I thought. They looked fantastic together. They shouted SUMMER! And so, I put them all in the same bag - a preventative measure. I've been known to forget my brilliant ideas almost as quickly as they occur to me. But what to knit with these yarns? The first yarn is two skeins of Super 10 cotton. One skein was purchased at Purrsonnally Yours in Meaford for regular retail. The purpose of that purchase long escapes me. 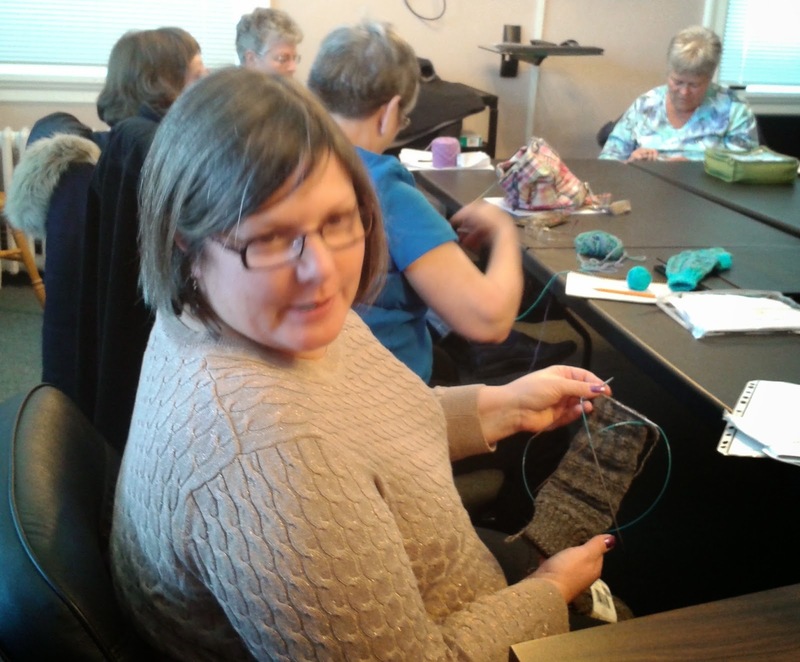 The second skein was purchased from a discount bin at last September's KW Knitters Fair for $4. A bright cheerful colour, it falls somewhere between orange and salmon, I'd say. Next up and from that same bargain bin at the KW Fair, I purchased a skein of Americo Cotton Flamme in a lovely spring green. Again, greatly discounted, I paid $4 for this $22 skein. 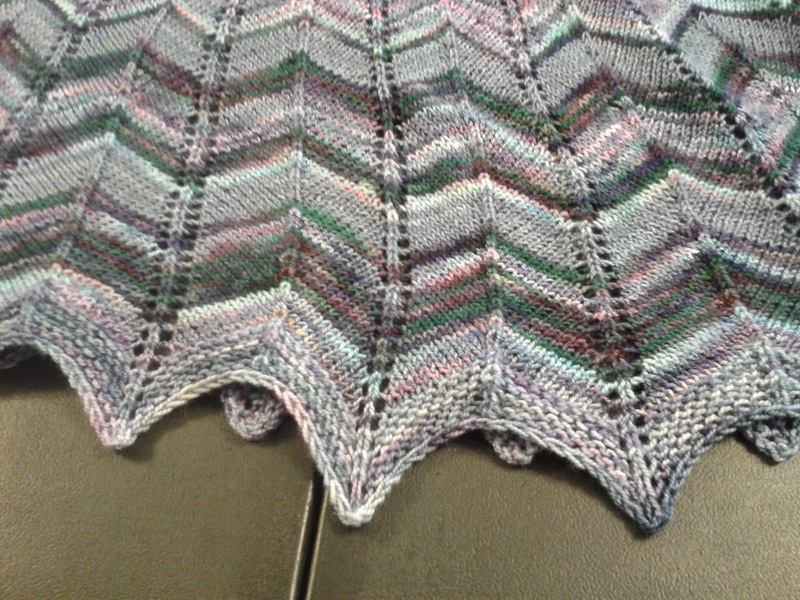 I remember thinking the value was too good to pass up and if nothing else, I'd knit a summer shawl. 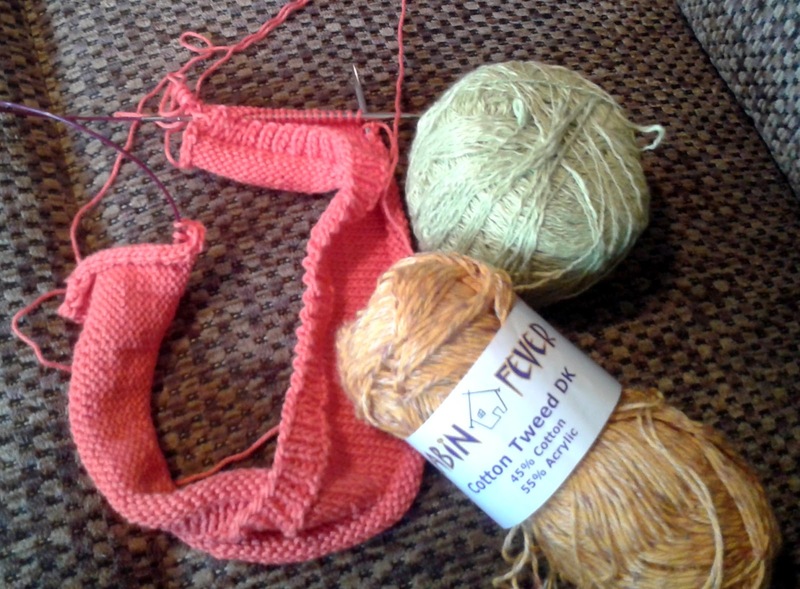 The last colour to join the 'let's knit summer' group was a yellow Cabin Fever Cotton Tweed. I picked up four balls of this colour a couple of years ago thinking I would use it as the upper colour against a dark brown bottom to knit Heidi Kirrmaier's Thunderbolt. That hasn't happened yet, so the yarn was just waiting to be chosen. All three of these colours are much more robust than my camera and computer screen like to reveal. Trust me on their cheerful, summer nature. 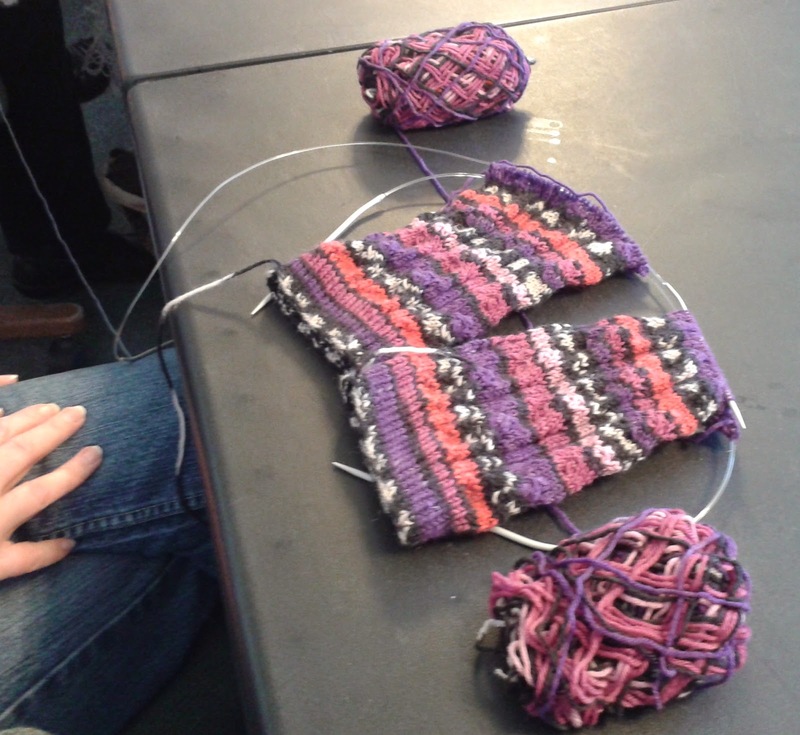 Then the question was 'which pattern'? Patchwork seems to have put me on the path of multi- coloured patterns. But having just completed its precise, squared look, I wanted something more free flowing. So Sheer Panel it is. Described as sheer because the designer used a thinner, therefore see-through yarn for the centre panel. Mine will only be partially see-through. 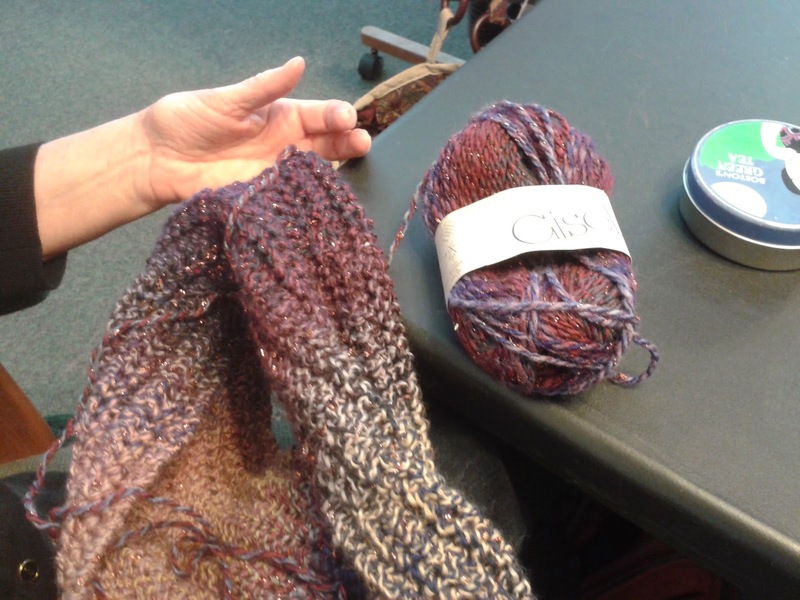 Flamme is a thick and thin yarn. See-through in the thin parts, not so much in the thick parts. The photo shows my third start. Take one, I didn't read the pattern gauge - just thought I knew it was 22 stitches. Nope, 20. Rip. 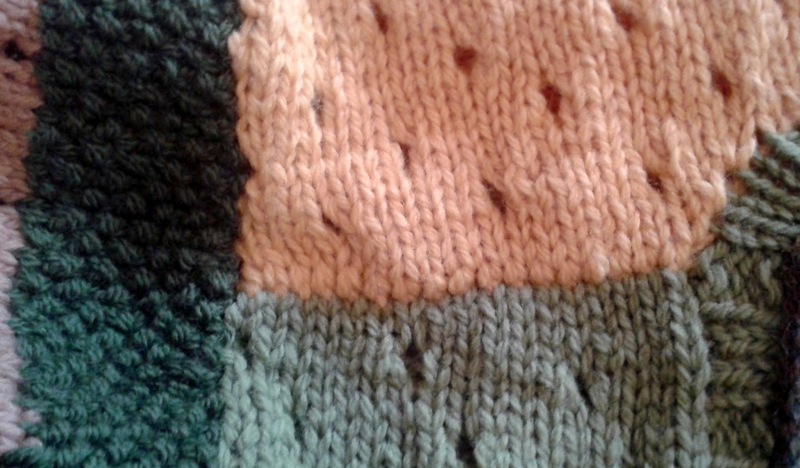 Take two, I didn't like the rolling ribbing, so re-knit to put a row of purl stitches at the top of the ribbing. Take three - and final take - I hope. I mis-read the chart and wasn't going to have the 'right' look for the sheer part. Rip. There seems to be a pattern of arrogance going on here. I THINK I know something, but it isn't so. Knitting teaches humility. Although Radicchio and my sideways vest earned 'first past the post' spots of 2015, they have 'buts' attached. Radicchio might have been the first sweater finished - but - it was started last year. 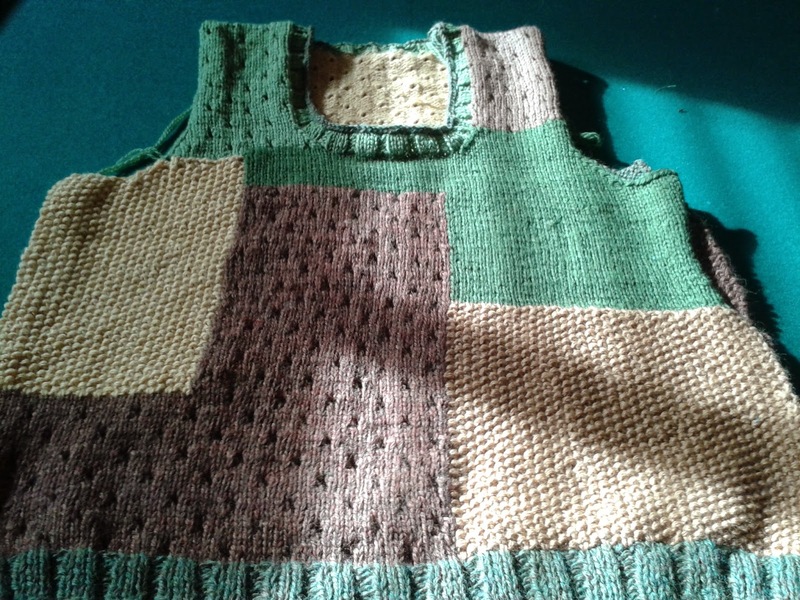 The Sideways Vest was finished before Patchwork - but - it is a vest. 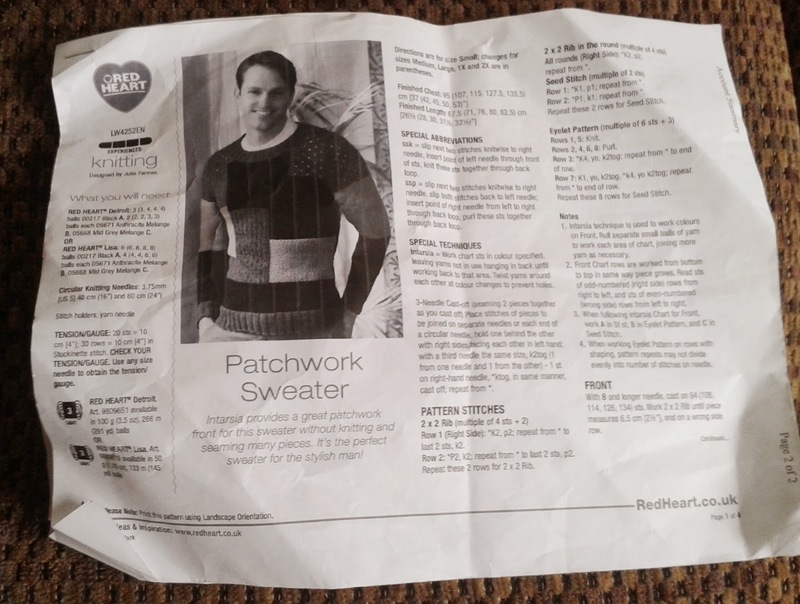 Patchwork claims the designation of first sweater started and finished in 2015. Started on the back deck of Ruby's Florida condo in January, and finished in the reclining chair in my living room in March. Not bad considering there were 5 weeks of vacation time in there. Pattern: Patchwork by Julie Farmer. Yarn: Knit Pick's Palette held double. A gift from friend Nicki. 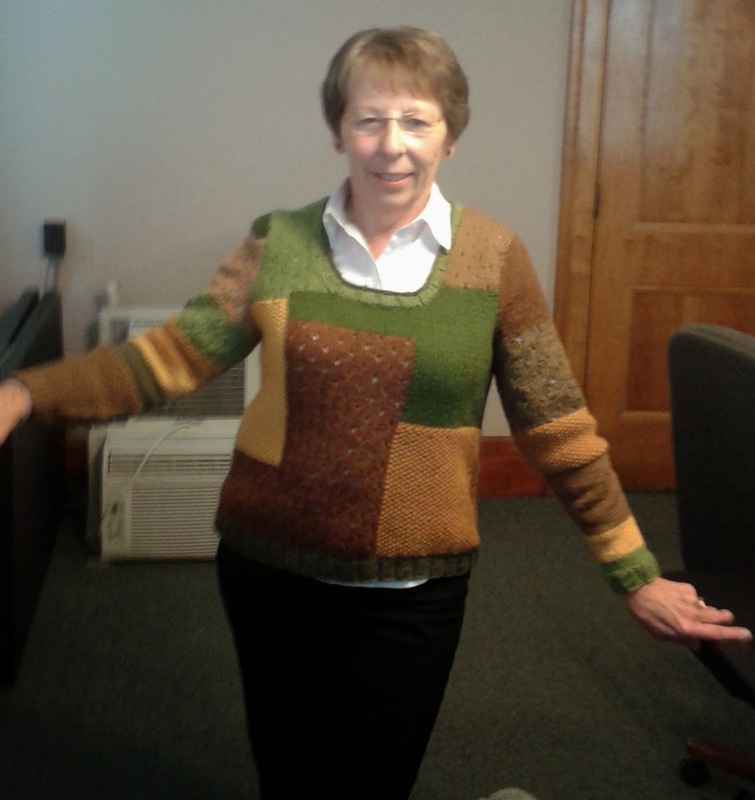 Her hubby gave her a giant container of the entire colourway of Knit Pick's yarns a few years ago as a Christmas gift. Knowing that they didn't suit her, she gave me all the balls of yarn that qualified as 'autumn' colours. Gauge: 18 sts over 4 inches. Mods: This being a man's pattern, there were a few changes made. Other than following cast on numbers and the patchwork chart contained in the pattern, I mostly designed on the fly. 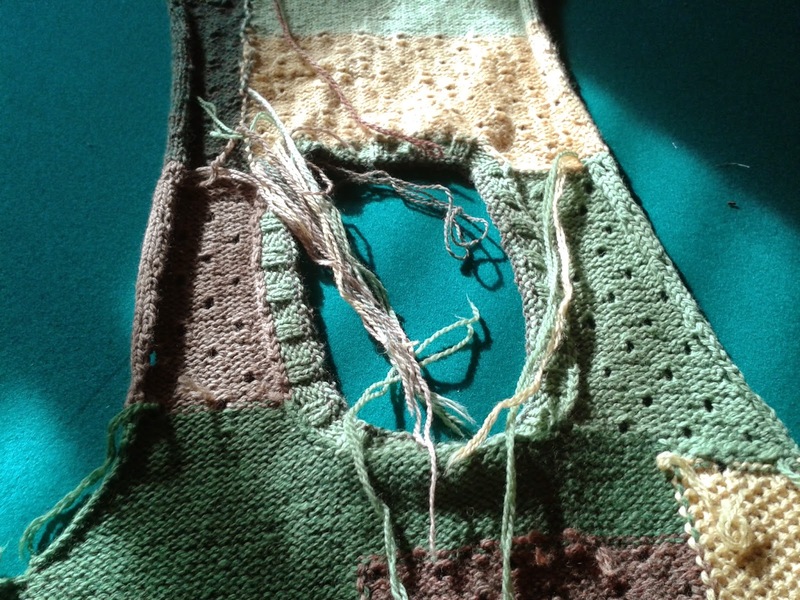 *I eliminated the band of colour above the ribbing and went directly to the patchwork design. Perhaps a man can wear a band of colour around his hips with no non-flattering implications, but not me. 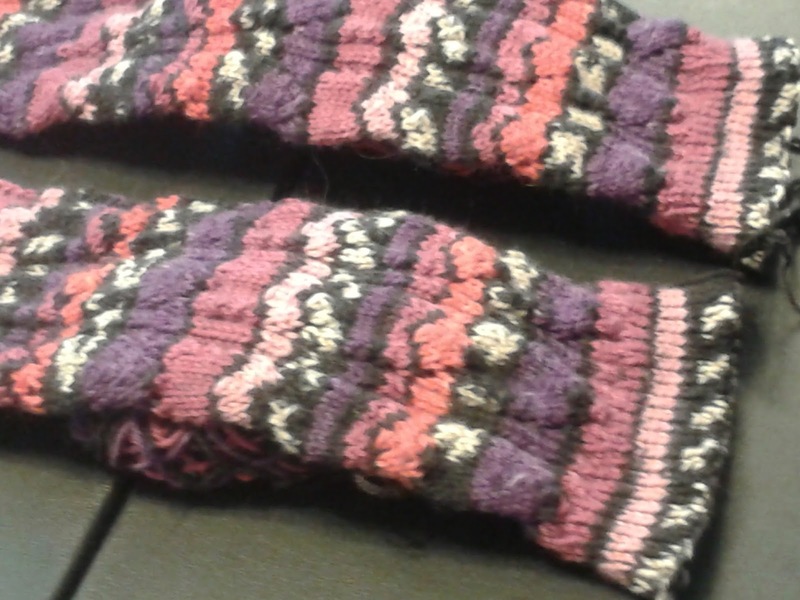 *I also made the ribbing narrower - one inch instead of the 2.5 called for in the pattern for the same reason. *Waist shaping was added because - well - I have one. *And I lowered the neckline. I thought it suited the sweater more and would also show off whatever blouse I might wear under the sweater. 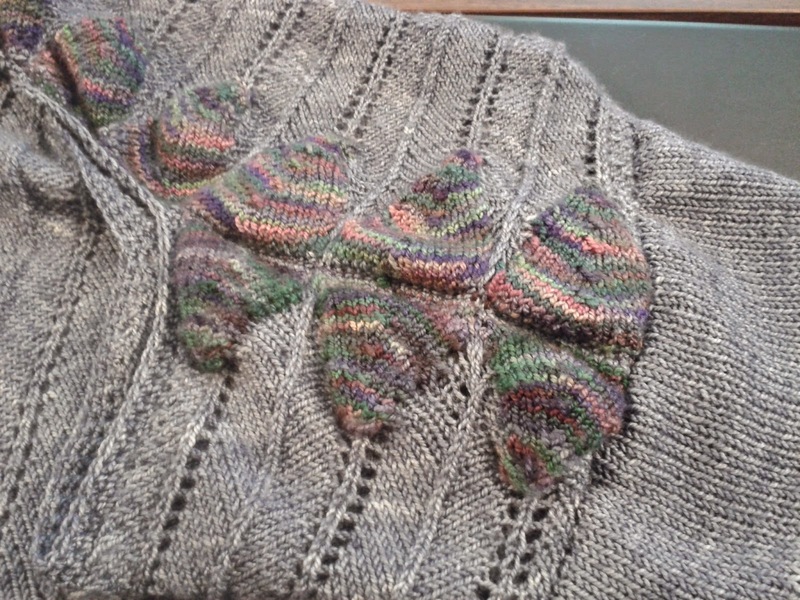 *The shoulder slope was shaped with short rows then used a three needle bind off to join them. Lovely, I think. *Lastly, I think, I narrowed the shoulders to fit me. My shoulders are 14 inches across. With a set-in sleeve sweater, I am very particular that the sleeve cap seam sit precisely on my shoulder bump/bone and does not droop. It is a poorly done sleeve that droops below that bump. With knitting being as stretchy as it is, the droop comes more naturally in a sweater than it might in a tailored fabric garment. 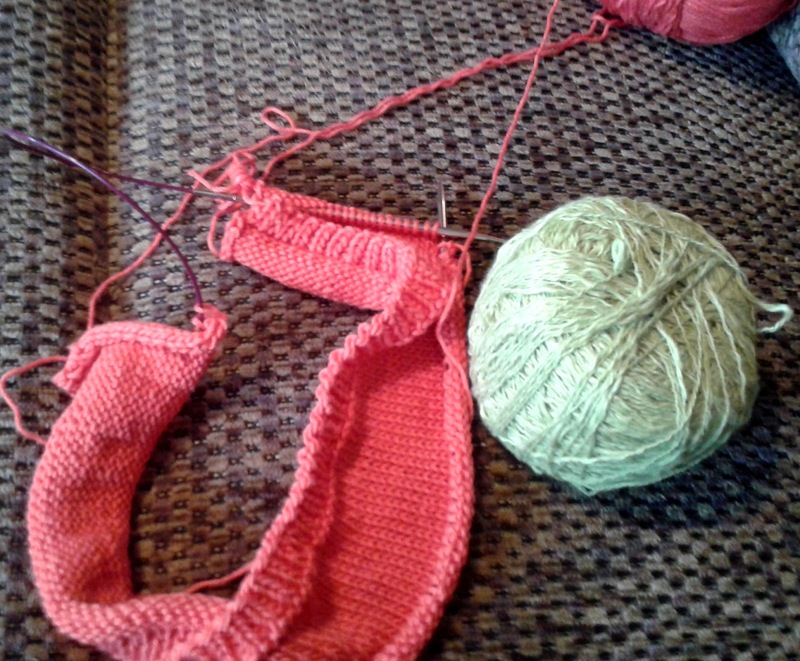 To counteract that possibility, while knitting the armholes, I continued decreasing until the body width was 13 1/2 inches. That amounts to a quarter inch of negative width at each side - my droop allowance. You can see at the bottom of the post, how nicely those sweater shoulders sit on mine. I did run out of yarn and had to use some of my own stash yarn to finish the sweater. But since the colours Nicki chose to give me are definitely 'my' colours, I had lots of yarn that would do. Sensing that I might run out of yarn, I stopped sleeve number one at the underarm in order to begin sleeve two with the remaining yarn. Sleeve two didn't quite get to the underarm before all the yarn was gone. 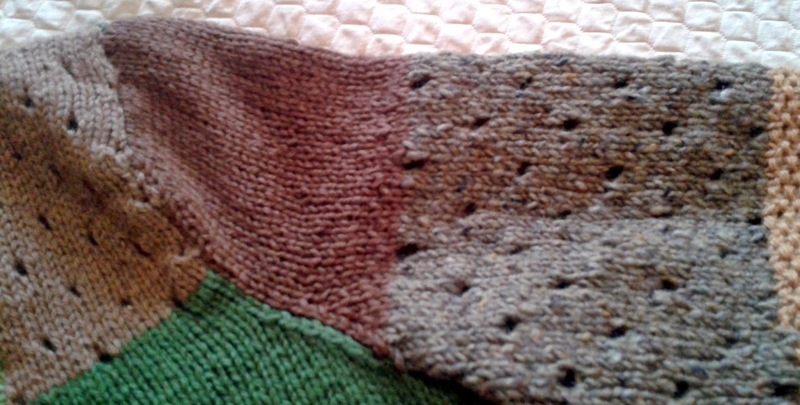 Above, in the shoulder seam photo, the green sleeve cap on the left, knit in seed stitch, is yarn from my stash. 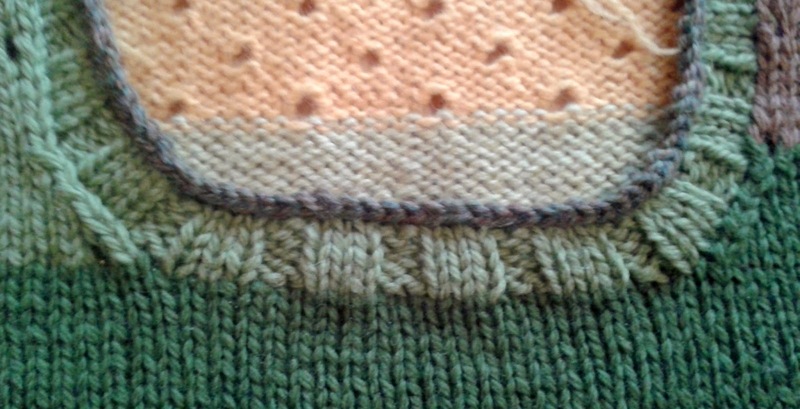 Below, on the other sleeve, the two upper colours - the grey green and the rust brown are both from my stash. See, it pays to have a wardrobe that lacks diversity of colour. The neckline is trimmed in the same ribbing as the cuffs and lower hem. K3, P2. 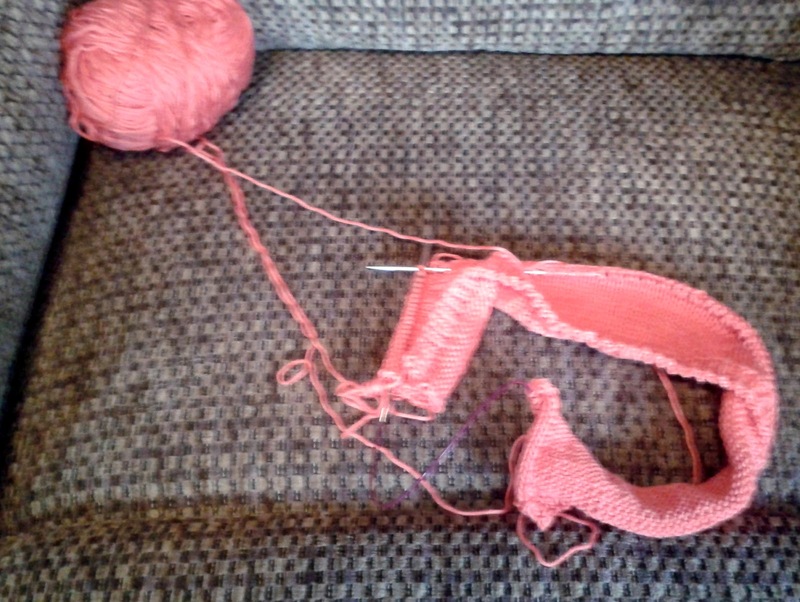 I also did not use a smaller needle for the ribbing. I didn't want the hem to pull in - those hips again - so used the same size needle for ribbing as I did for the body. 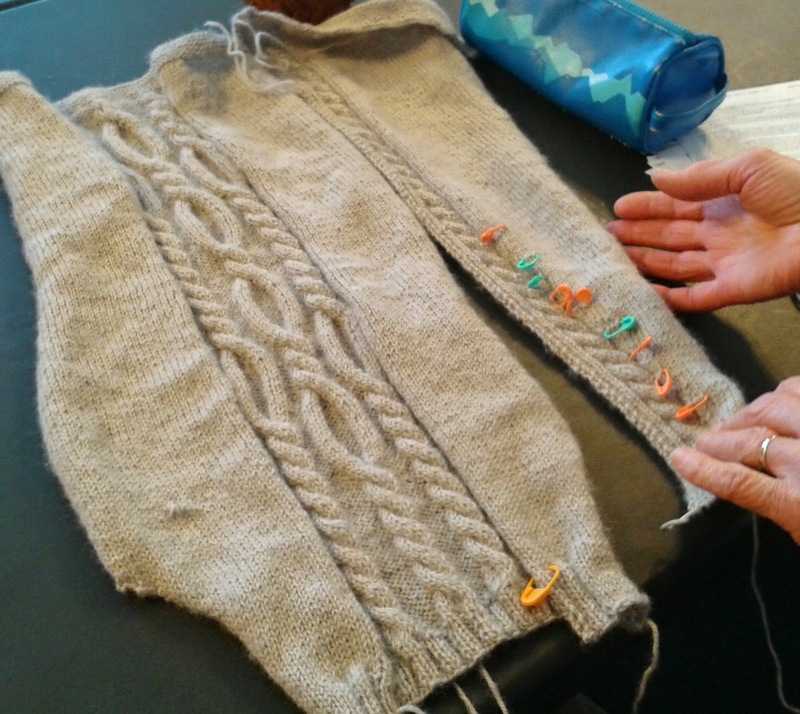 The neckline was finished with 5 rows of ribbing, one row of straight knitting then the cast off. The row of straight knitting was done for a couple of reasons. I wanted two colours at the neckline. 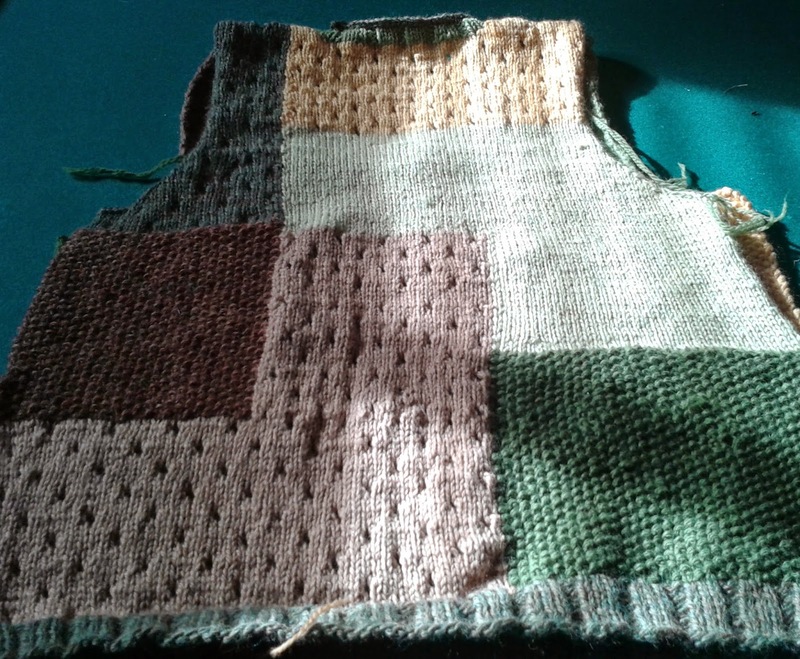 I had just enough of the darker green (yes it is dark green, not grey) left for two rows and wanting a bit of a rolled looked to the edge AND not wanting the purl bumps to show in a different colour meant I had to work a knit only row, then the cast off. I really like the finished product. During the last couple of days of knitting on Patchwork, the weather warmed up and I thought I would simply be placing Patchwork on a shelf until next winter. But then another cold spell settled on our area and I was able to wear the sweater three days straight last week. It wears well - always, in my opinion, the true test of knitting success. I received many compliments on it - test number two some might say. Next test will be to see how the 'economy' yarn holds up. 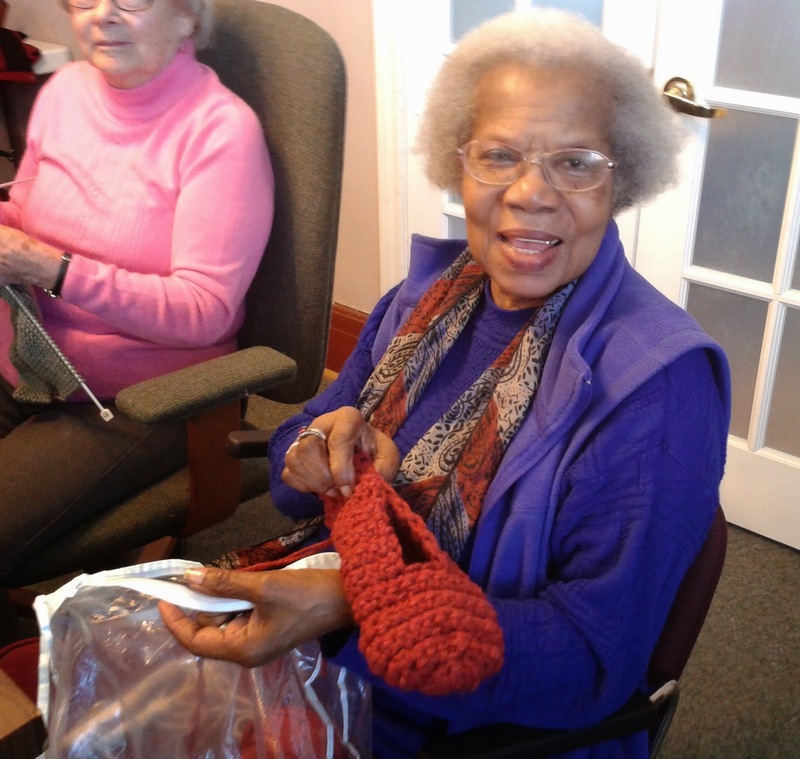 Even when posted on a Friday, Thursdays Are Still For Knit Group. And thanks to Nan for the gentle prodding about no blog postings. "Where are you?" she asked. "Are you sick?" No, not sick. Just busy doing some sorting, spring cleaning and knitting without enough progress for posting. 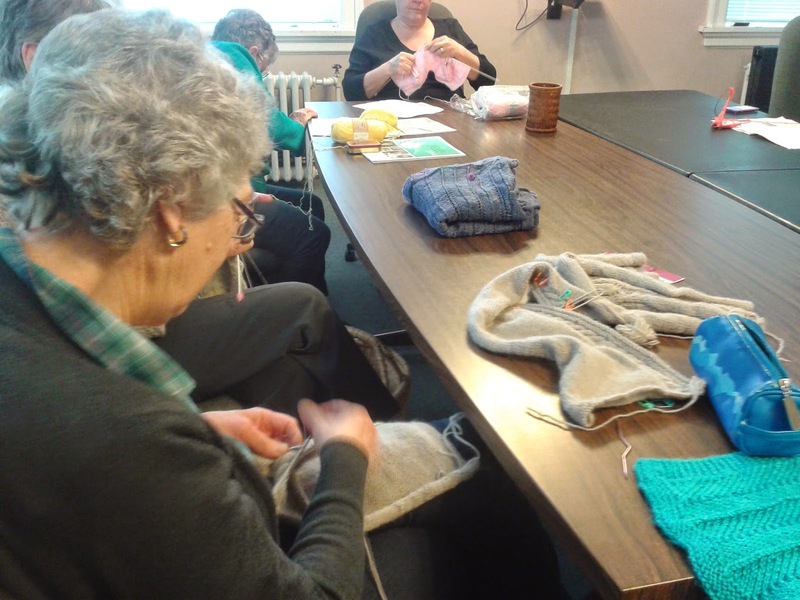 No one at knit group seemed to be having the no progress problem though. Well, perhaps Wilma. Ingrid of course has another new and unique project. Shades of denim, -not the greys that my camera shows - in a tunic style, this piece is another one-of-a-kind. The colourful shoulder pieces were knit separately then knitted on. 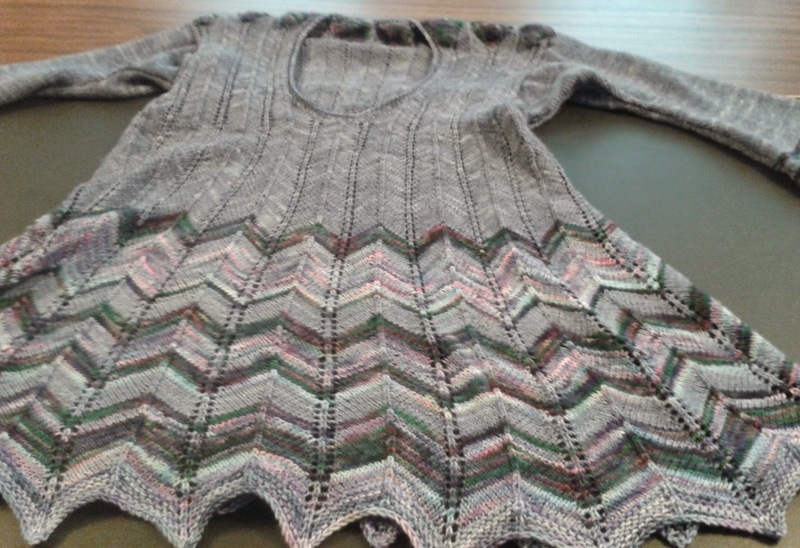 Does that inspire everyone to try knitting a tunic on small needles with fine yarn? Or shall we leave it to Ingrid? 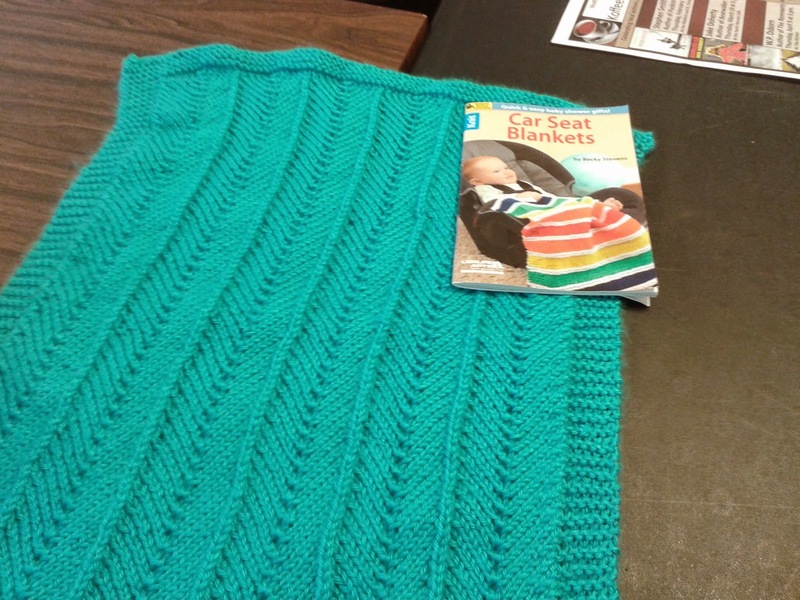 Gail had started a cute baby sweater with Astra. She is still working her way through a box of yarn given to her by the husband of a friend who passed away a year ago December. That's a lot of yarn. 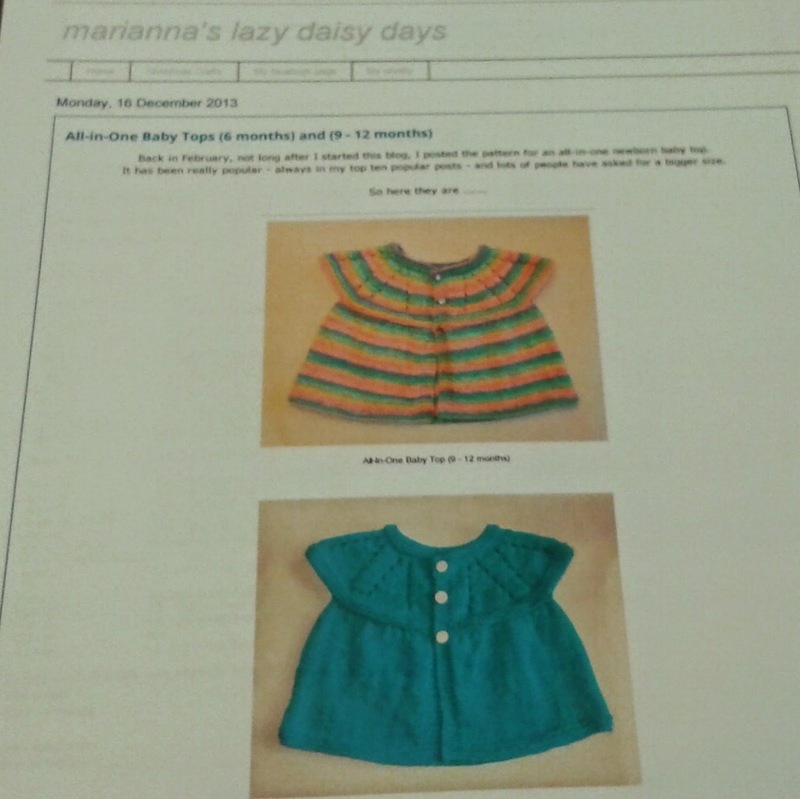 Sharon R is working on a baby dress as well. Different reason than Gail, though. 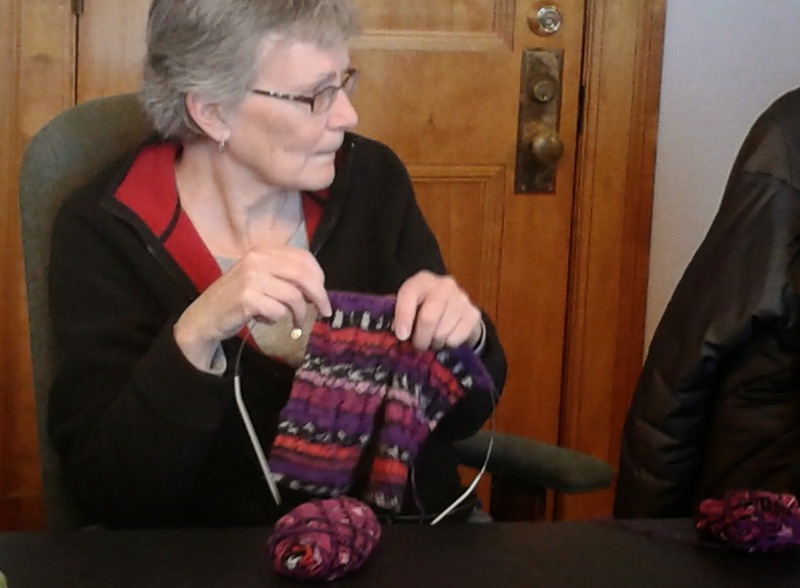 Sharon, being a relatively new knitter, challenges herself to learn something new with each project. This little dress has taught her a new stitch design, and the top-down technique. A cowl. Lovely yarn with a bit of a sparkle. 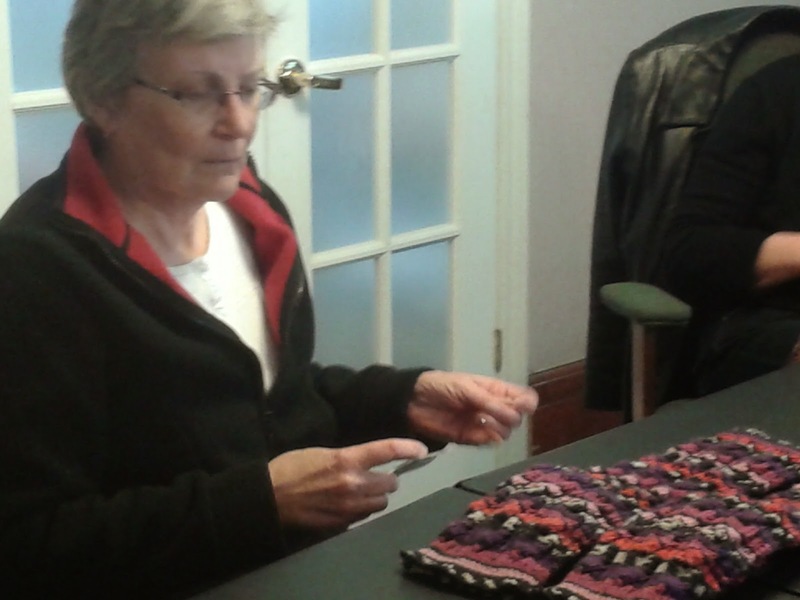 The ends are meant to be sewn together and Sharon thinks she might put a twist in it before she does that sewing. Jean has finished those two at a time, on two circs, leg warmers, knit with Kroy sock yarn. Too late, Gail told her the easier way to do leg warmers is to head to the thrift shop, buy a wool sweater and cut off the sleeves for leg warmers. Now that's a plan. Wilma is still working on the grey cabled vest. She is tired of it she says. So tired of it, she took a time out and knit a small baby blanket to give the vest a rest. 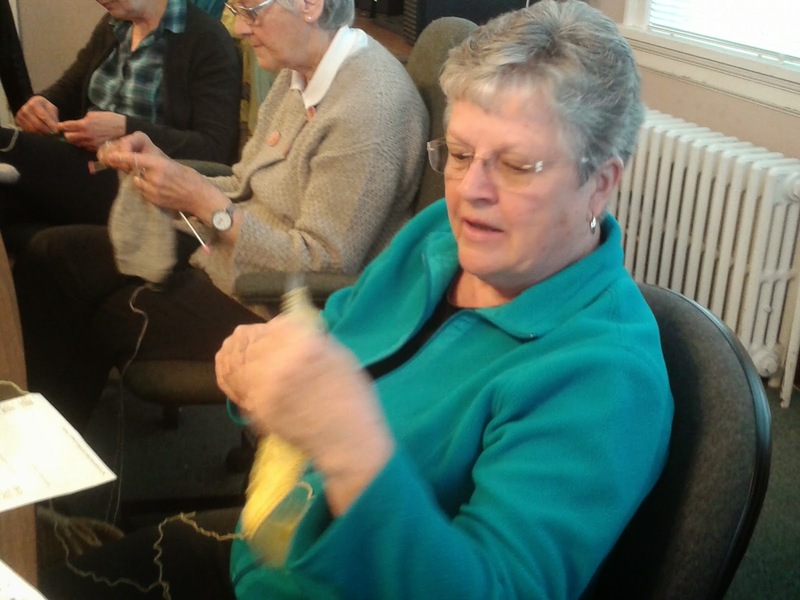 We've heard from all our snow birds and by mid April, they will all be back in town and at knit group, we hope. Till then, we'll keep our needles moving. 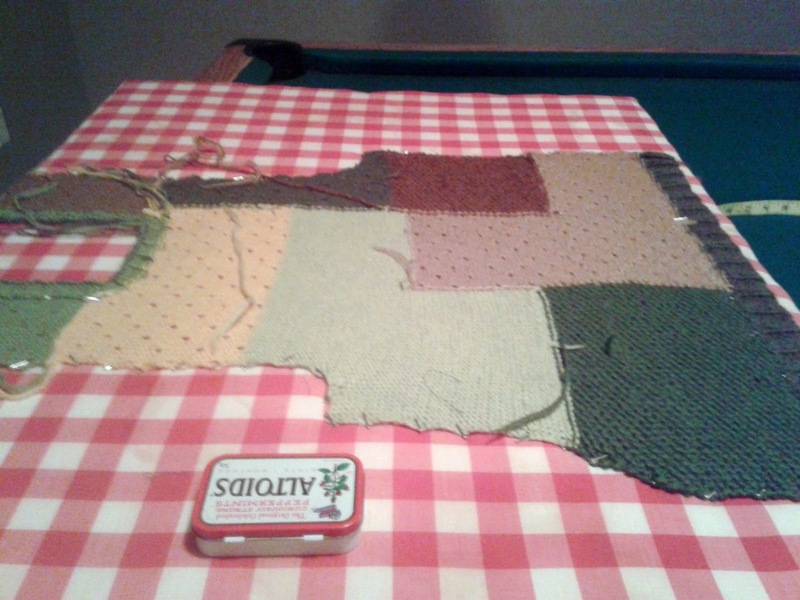 Patchwork's sleeves have been started. Sleeves done on straight needles, knitting back and forth, seem to take me forever. Done on circs they go much more quickly. A bit of Magic Loop at the narrow beginning does the trick until the circumference is big enough to take the entire cable. 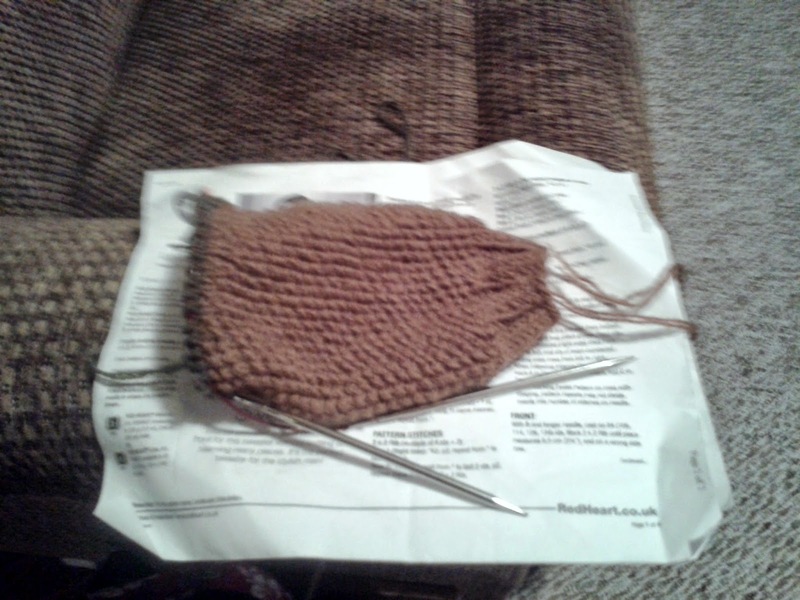 Once I get to the cap, I will revert to back and forth knitting for that shaping. 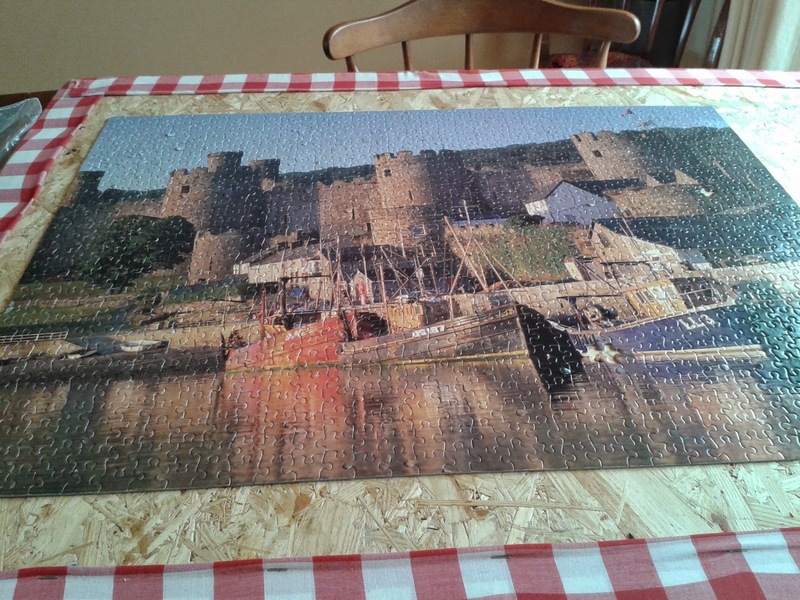 And - Fred's puzzle is finished. I purchased it for him at Valu Village for 99 cents. He sure got his money's worth. And I have my blocking board back. Patchwork is on the board now. 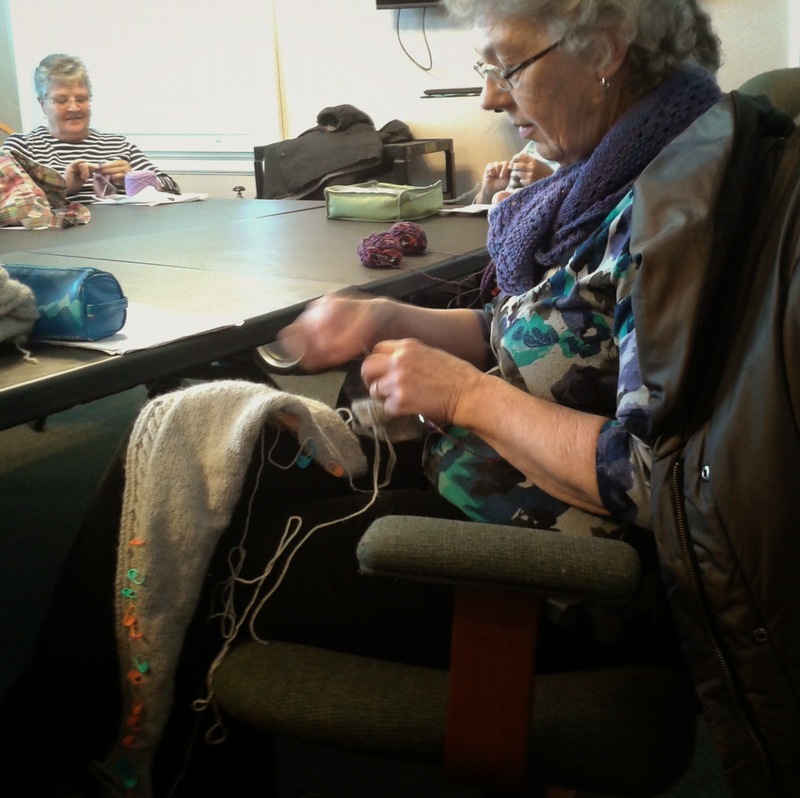 Our weather is showing definite signs of spring or as we knitters call it 'cotton knittin' time'. I want Patches done before that cotton leaps onto my needles. PS: I sound like Rick Mercer but - Gail A sent me this notice about a workshop at Storybook Farm in Manitoba. If you are out that way, drop in. sweater to Hawaii. Day one, during the long, ten-hour flight, I did knit. Then the poor thing was stuffed into a bag and never saw any Hawaiian scenery at all. The flight home started at 11pm. The plane was dark and I was tired, so no knitting on that trip. Back in the groove now - or at least getting there- and Patchwork and I have shared some time together. Both the back and the front are now complete and shoulders sewn together with a three needle bind off. but I've learned to sew in ends last. Too often when I've sewn them in before completion, I end up trying to find those darn tails in order to remove them for a re-knit. 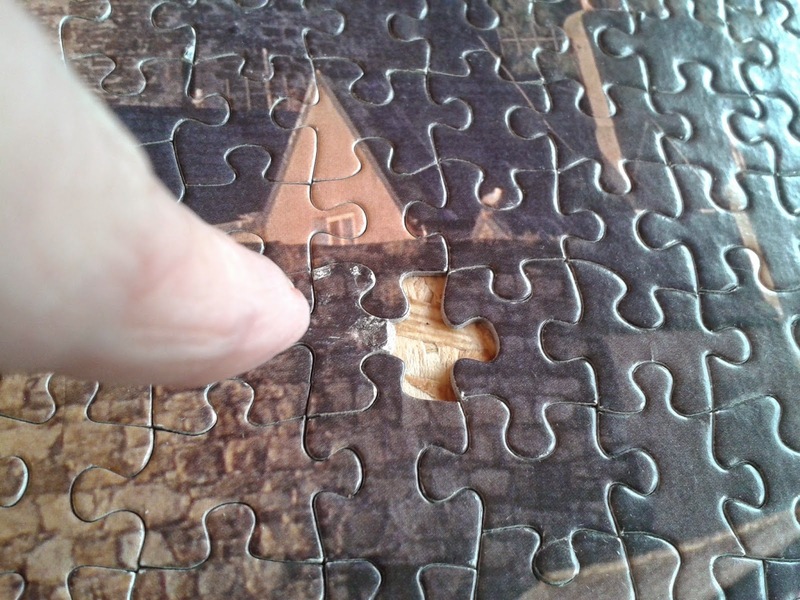 These pieces need to be blocked but I am waiting for Fred to finish his latest puzzle. He has confiscated my blocking board for his puzzle pastime. That means I must schedule blocking between puzzles. Sensing spring in the air though, I am hopeful he will give up the puzzling soon. 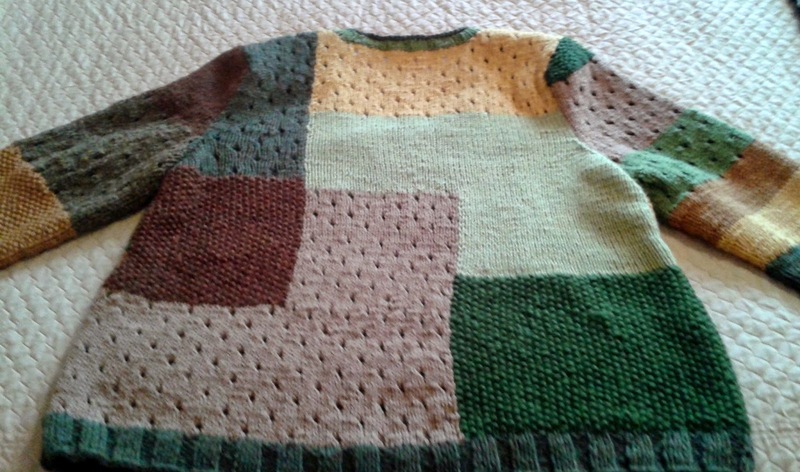 Patchwork, you may remember, is knit with two strands of Knit Picks Palette. It is my first time using Knit Picks yarn and I am interested to see the knit-life of this economy wool. Tomorrow, on to the sleeves. Three weeks in Hawaii has taught me that there is another 'half' out there. For a mere three weeks, I was one of them. We loved Hawaii. The weather, the culture, the scenery - but mostly the people. Everywhere, every time we encountered a person of Hawaiian heritage, we saw a fun-loving, kind, gentle, hard working, happy, helpful person. Quite different from the 'native' issues other countries experience. 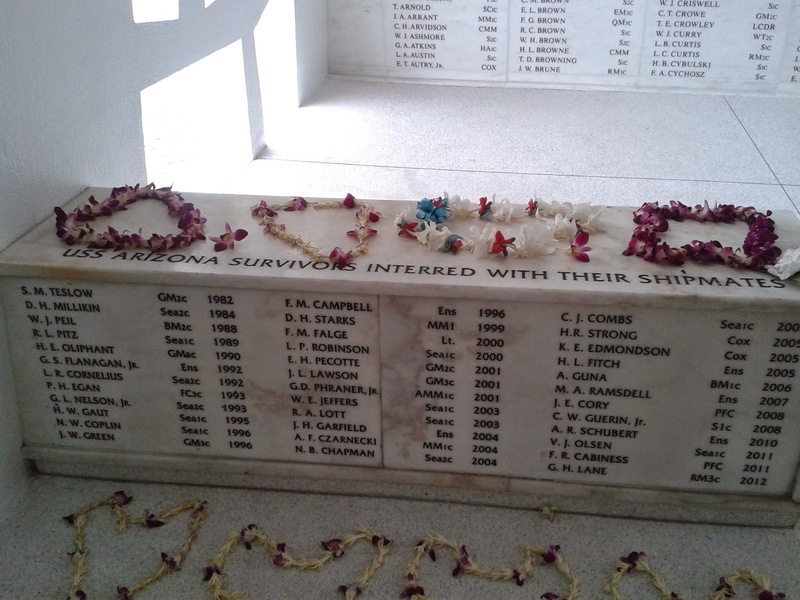 We spent most afternoons at Waikiki which was a short walk from our hotel, and took a half day tour of Pearl Harbour. 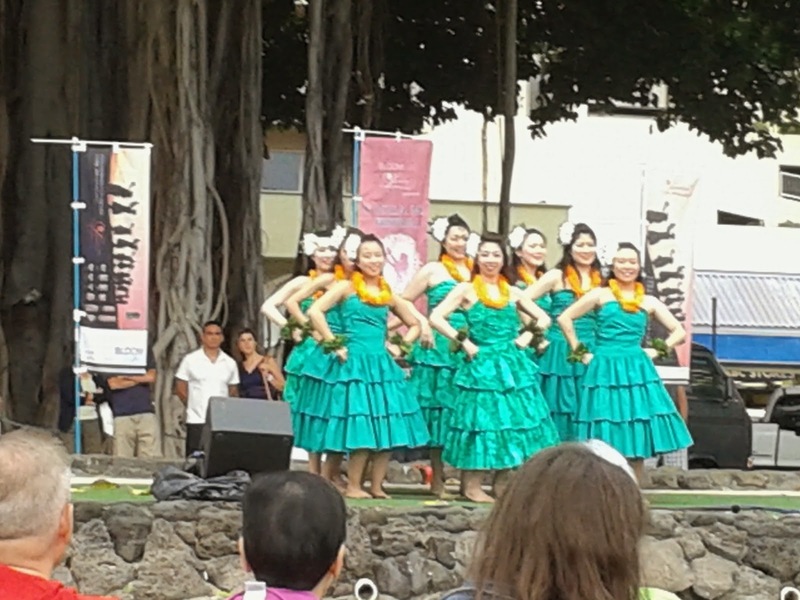 At Waikiki, there is a public park and often there were performances of native Hawaiian dance at the park. 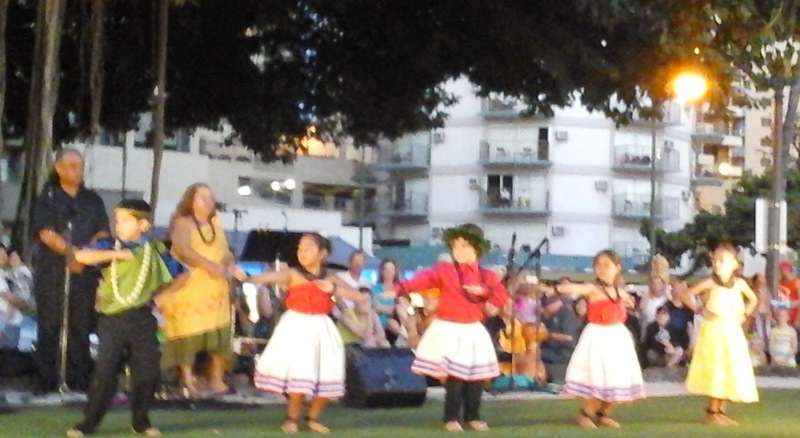 Below a chiildren's group performs native Hawaiian dance. on the island of Hawaii. 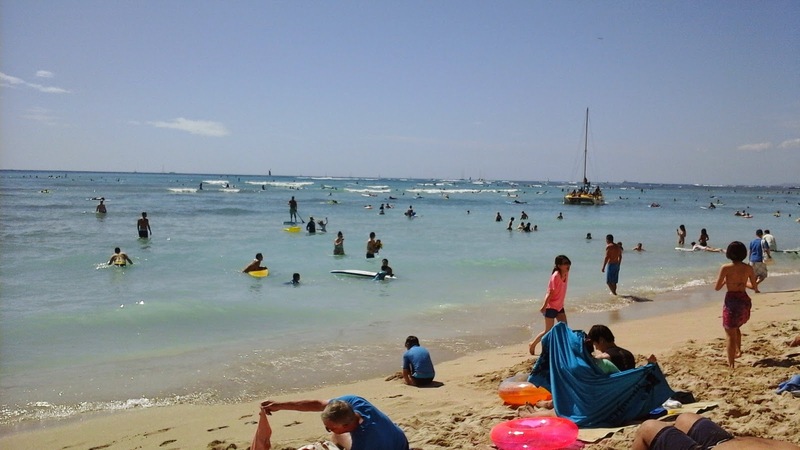 It is as different from Honolulu as night to day. Small town versus big city. Totally a tourist town versus working city with tourists. Lava rock, non-swimmable beaches versus Waikiki Beach. 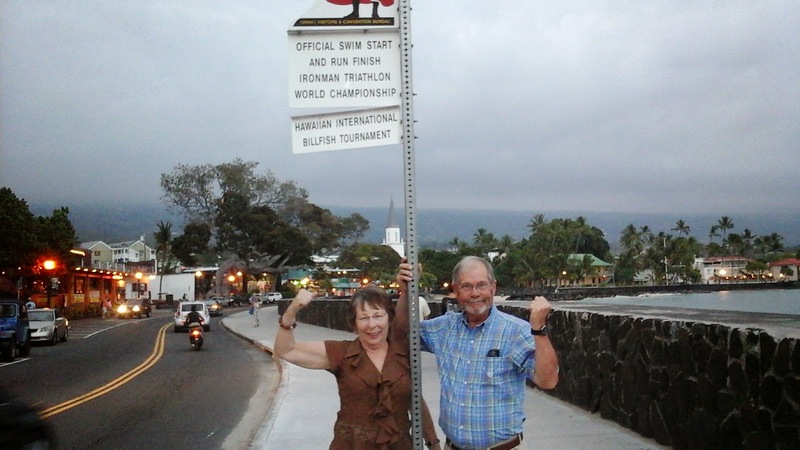 While in Kona, we did a lot of day-trips. We went up the mountain to Volcano National Park to see a live volcano. 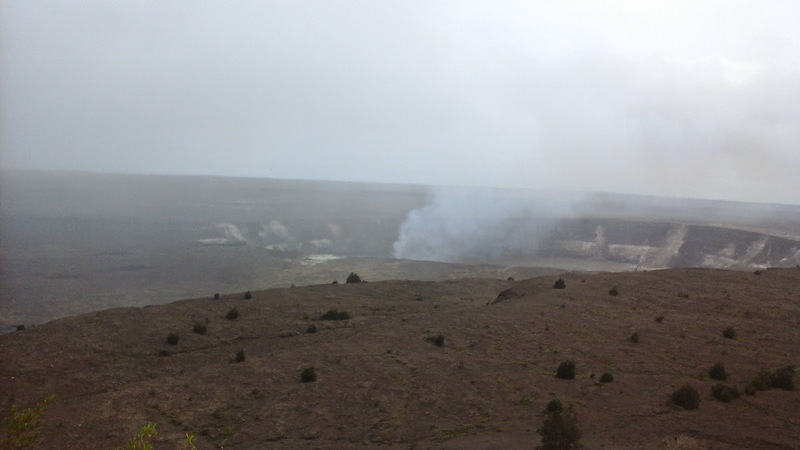 Fortunately - in my opinion at least - we saw only the geo-thermal steam geysers not flowing lava. One day we travelled to the south end of the island - the southern most part of the U. S. A. There we watched, as many jumped off the 40 foot cliff into the Pacific Ocean. A small coffee farm was one afternoon's attraction. 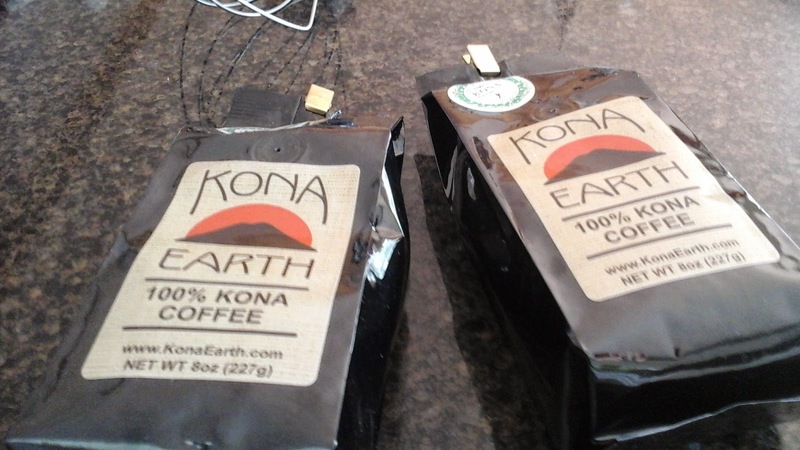 A couple and their two children from California opted out of the 9 -5 routine and bought a run-down coffee farm in Kona. They have spent several years converting it to a viable business. They gave us a tour followed by some home-made chocolate chip cookies and a cup of the best coffee I have tasted - EVER! 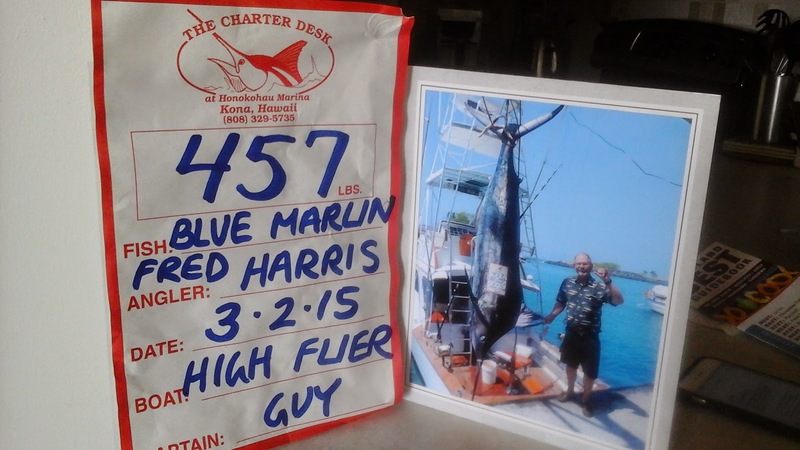 Fred would be upset if I didn't mention that he and my BIL went on a deep-sea fishing charter and Fred caught a 457 pound Blue Marlin. He has a picture that looks just like all the ones you might see on television. He is still thinking of that day. This morning he measured the fish in the picture so he could calculate the scale. A little something to add to his story. Home now and adjusting to the 6 hour time change. I have picked up my needles and wonder of wonders, have not forgotten how to knit. Home from Hawaii for two days now and almost accustomed to the 6 hour time change. 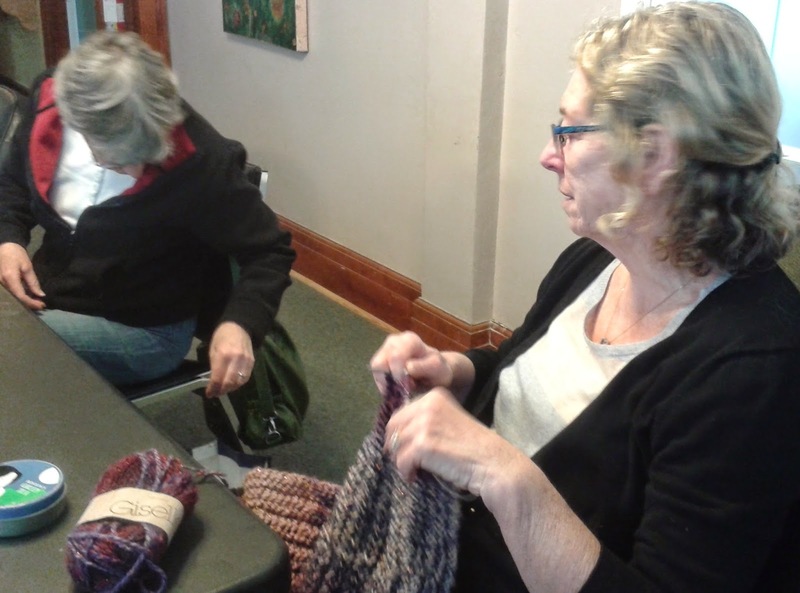 Accustomed enough, at least, to arrive at knit group on time. It was good to see everyone and to get caught up on all the knitting. Jean has two very colourful leg warmers on the go. 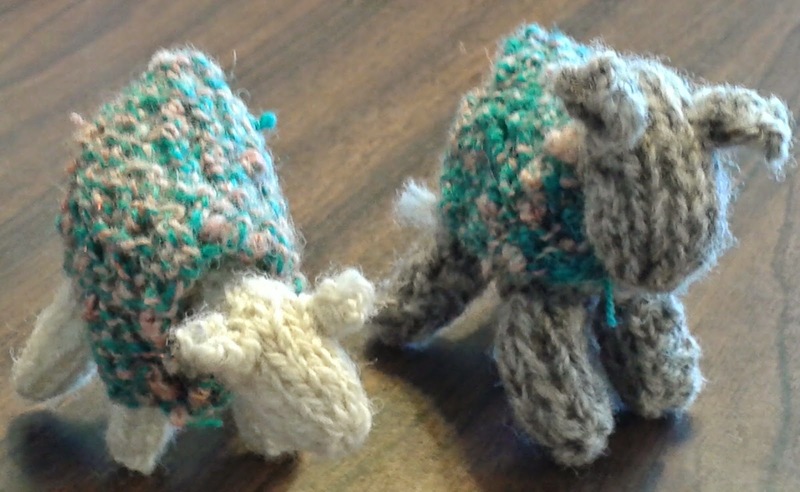 Both on the same circular needle, they are knit with Kroy sock yarn. They should be as warm as they are cheerful. 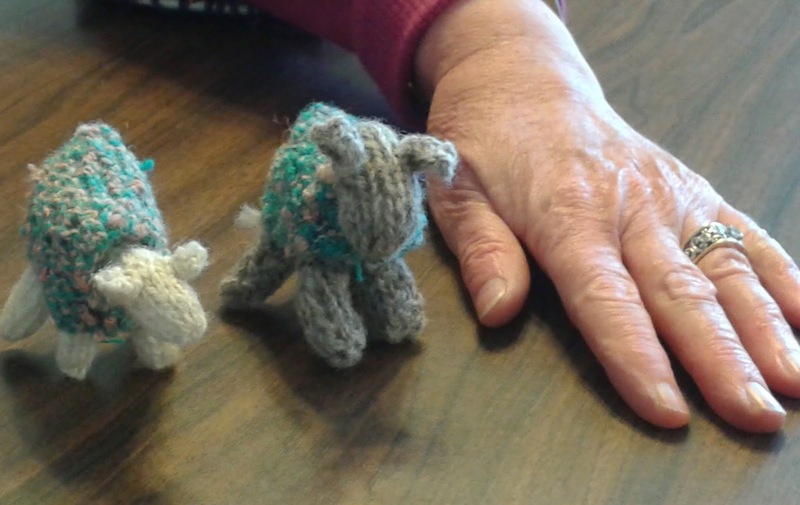 Sharon and Jean have both knit little sheep from hand spun yarn. Ready for their Guild sale next November, they are just the cutest. To be fully finished, they both need faces. Tiny, tiny faces, as you can see by the hand comparison. Wilma is working on something that obviously requires many, many markers. It's a vest she said. And the markers are a lazy knitter's device for row counting. Her words. Here she has laid out the back with its glorious cable and the front, markers in tact, beside it. Doreen has one slipper finished for a friend. Too large, she says, so a bit of re-knitting is required. You might think she is very happy with the results. But I made her pose 3 time to get the smile. Lorrie's sock interested me. 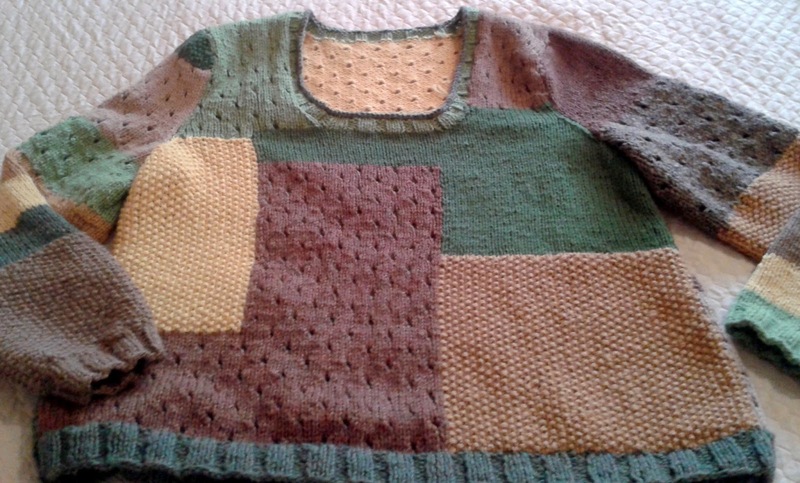 The pattern is lovely and it looks so warm and cozy. and after three weeks down there, I am in the mood for summer things. The knitters told me though that they experienced extreme cold and strong winds while I was away. Guess warm and cozy is here for awhile yet.